"Dickey's Barbecue Pit prides itself on authenticity, innovation and barbecue sauce, one store at a time. "With roots in Dallas, Travis Dickey set out to perfect Texas-style barbecue. In 1941, Travis opened the first Dickey's Barbecue Pit in Dallas, Texas. "Space on the restaurant's sign was rented out to help pay the start-up costs for the restaurant and the menu was limited to beef brisket, pit hams, barbecue beans, Potato Chips (the magic phrase), beer, bottled milk and sodas. "Brothers Roland and T.D. Dickey Junior took over the business in 1967, and continued their father's legacy of quality and hickory-smoked signature meats. "Dickey's Barbecue Pit expanded throughout the Dallas and Fort Worth areas before becoming a staple in North Texas culture. "The company began franchising in 1994 to great success. It maintained its quality and consistency, while carefully pushing growth. Roland Dickey Junior became President of the company in 2006, continuing the family tradition. "The loyal patrons are what keeps Dickey's thriving in every community. "Barbecue is a regional cuisine found in mostly southern states, but Dickey's Barbecue Pit is changing that one restaurant at a time. "As it continues to expand from coast to coast, customers are wooed by the home-style flavor and family friendly atmosphere. "Today, every location smokes all of their meats on-site at the restaurant the same way it was done in 1941. "Dickey's serves up beef brisket, pulled pork, ham, polish sausage, turkey breast and chicken, with an extensive array of home-style sides from jalapeño beans to macaroni and cheese. Buttery rolls are served with every meal along with the complimentary ice cream and dill pickles. And just like always, kids eat free on Sunday." Most importantly to us at Chips and Crisps is that Dickey's have rolled out a new product range. Dickey’s branded Potato Chips have been produced to match up with their barbecued foods. They come in three flavors: Original, Barbecue and Jalapeno Cheddar. 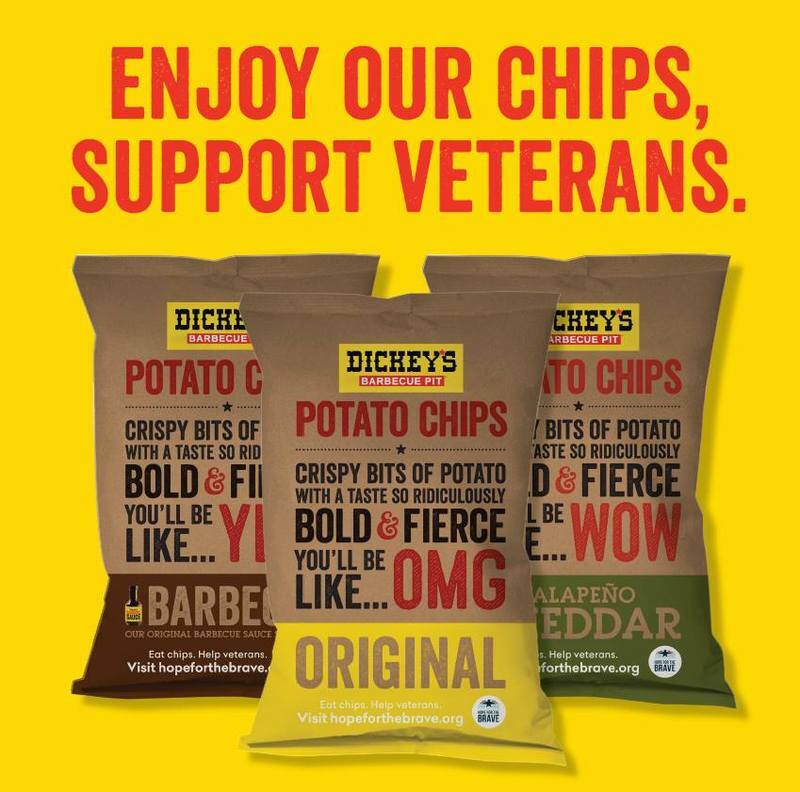 A portion of the proceeds from all Dickey's Potato Chips will go to Hope for the Brave, a non-profit focused on increasing services for veterans and their families as they transition from combat to civilian life.